The story of David and Goliath is told in music and narrative in this exciting production, complete with sound effects and drama! 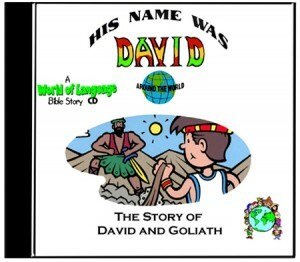 Then kids connect to other countries by learning to say “His Name Was David” in 10 languages, including Portuguese, Greek, Korean, Polish, Arabic, Spanish, German, French, Hebrew, and Swahili! PARENT’S GUIDE Children’s Media Award Winner.